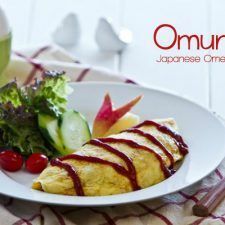 Omurice is a classic Japanese Yoshoku recipe, savory chicken ketchup fried rice wrapped in a thin layer of egg. Cut the chicken into 1/2" (1 cm) pieces. 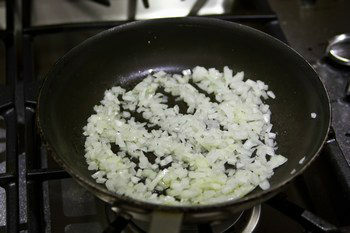 Heat the oil in a non-stick pan and sauté the onion until softened. Add the chicken and cook until no longer pink. Add the mixed vegetables and season with salt and pepper. 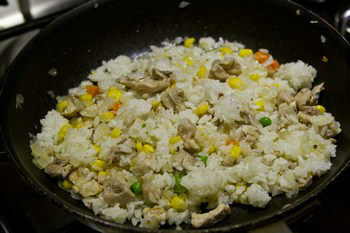 Add the rice and break into small pieces. 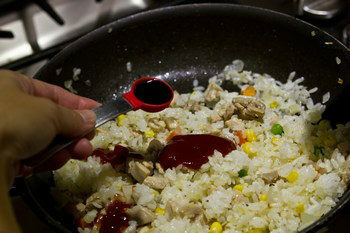 Add ketchup and soy sauce and combine everything evenly with a spatula. 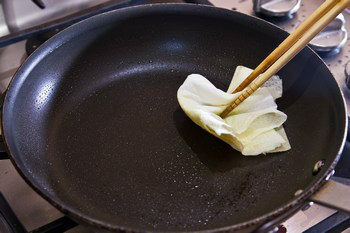 Transfer the fried rice to a plate and wash the pan. We'll make the omelette one at a time. Whisk 1 egg and 1 Tbsp milk in a small bowl. Heat 1 Tbsp olive oil in the pan over medium high heat (make sure the surface of the pan is nicely coated with oil). 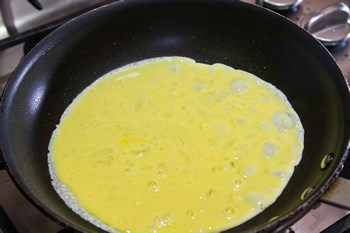 When the pan is hot, pour the egg mixture into the pan and tilt to cover the bottom of teh pan. 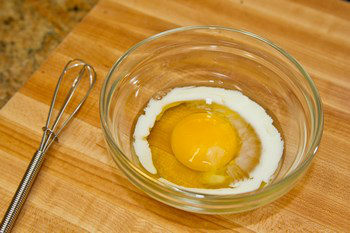 Lower the heat when the bottom of the egg has set (but still soft on top). Put the 3 Tbsp cheese and the divided fried rice on top of the omelette. Use the spatula to fold both sides of omelette toward the middle to cover the fried rice. Slowly move the omurice to the edge of the pan. Hold a plate in one hand and the pan in the other hand, flip the pan and move the omurice to the plate. While it’s still hot, cover the omurice with a paper towel and shape it into American /Rugby football shape. Drizzle the ketchup on top for decoration. 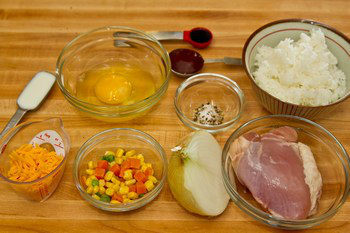 Continue making omelette till the fried rice is all used. Copyright © 2011-2018 Just One Cookbook®. All Rights Reserved.